The University of Chile is one of the oldest and largest institutions of higher education in Chile, attracting world-renowned researchers such as Dr. Martin Adams, Professor for the Department of Electrical Engineering and Principle Investigator at the Advanced Mining Technology Center (AMTC), led by project collaborator Prof. Javier Ruiz-del-Solar. Together, the organizations are working to further develop mining and ensure the welfare of mine employees in Chile and around the world. 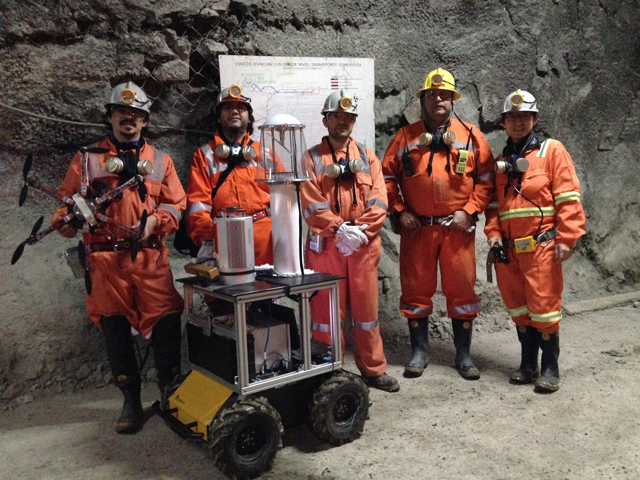 In an effort to minimize manpower in Chile’s challenging open pit mines, complex sensing and automation are necessary to complete tasks such as shovel-loading and transportation. Therefore, reliable interpretation of sensor data is critical, particularly for 3D rock surface profile estimation and 3D mapping. Within the mines, however, combining data from different sensors and systems can lead to issues with data interpretation and systems planning. The processing of such data, and its algorithmic combination with vehicle motion estimates, are necessary to correctly model surface profiles in the mines. These elements are paramount to improving the safety and efficiency of tele-operated, and ultimately autonomous, mining activities. Acknowledging a growing demand in autonomous mining technology and accurate data collection for improved safety, Dr. Martin Adams and team developed a project called Autonomous Rock Surface Modelling and Mapping in Mines. “Existing technologies are in early-stage development and require refinement,” explains Adams. “Our project will develop those technologies so that terrain surface profile and mine mapping information can be extracted from noisy sensor data,” explains Adams. Requiring a robotic platform that could handle the conditions of the mines and a dynamic payload, Dr. Adams reached out to Clearpath Robotics to use the Husky UGV for their project. The teams’ project was designed to collect motion characteristics (from Husky) and noise characteristics from radar, laser and vision-based sensors to model open pit and underground mines. Data fusion from different vehicle positions was then carried out for consistent surface profile and mine map estimation. “The Husky mobile platform was a very strong fit for our project in terms of payload capacity and ability to handle harsh terrain,” explains Adams. A millimeter wave radar was used for its unique ability to penetrate dust and other accruing atmospheric substances, providing valuable information missed by other sensors. Meanwhile, the team analyzed the robustness of laser-based feature detection by collecting data to determine a comparison of detection probabilities and false alarms in rugged environments. Visual-based feature detection algorithms such as the Speeded-Up Robust Feature (SURF) detection were also analyzed to determine the applicability of information extraction for mapping and surface profiling in mines. 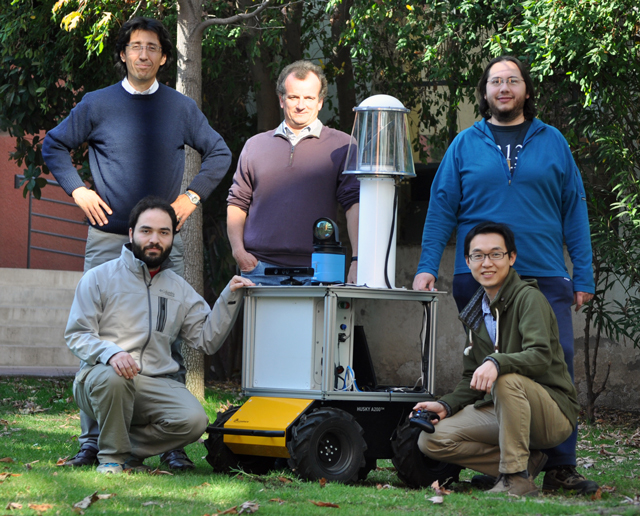 The Husky platform was chosen for the sensor-based experiments within the project because of its robustness, payload capability and open-source compatibility. All of the data collection and software processing algorithms used throughout the project were based on the Robot Operating System (ROS); “Husky’s compatibility with ROS made experiments run smoothly in terms of communicating between processes, sensors and the Husky itself;” says Adams. Since initiating the project, Dr. Adams’ team has discovered the registration problems associated with combining data from different sensors in a challenging environment. To do so, they have applied a variety of scan matching techniques and analyzed the acquired laser and radar data to improve the automatic detection of useful mine-based features. The 3D Riegl scanning laser range finder and an Acumine 2D scanning millimeter wave radar were transported on Husky and used to record video footage and densely sampled data sets. The data is being submitted to the International Journal of Robotics Research to ensure that this insight and information is available to the robotics community. Lastly, a leading mining company in Chile has expressed interest in acquiring similar robotic systems to create 3D maps within their mines; discussions with this company are underway. “Our Husky-based sensing system will contribute significantly to the success and efficiency in which future mining operations take place,” says Adams.